US Route 1 In Princeton: Too Big To Fail. 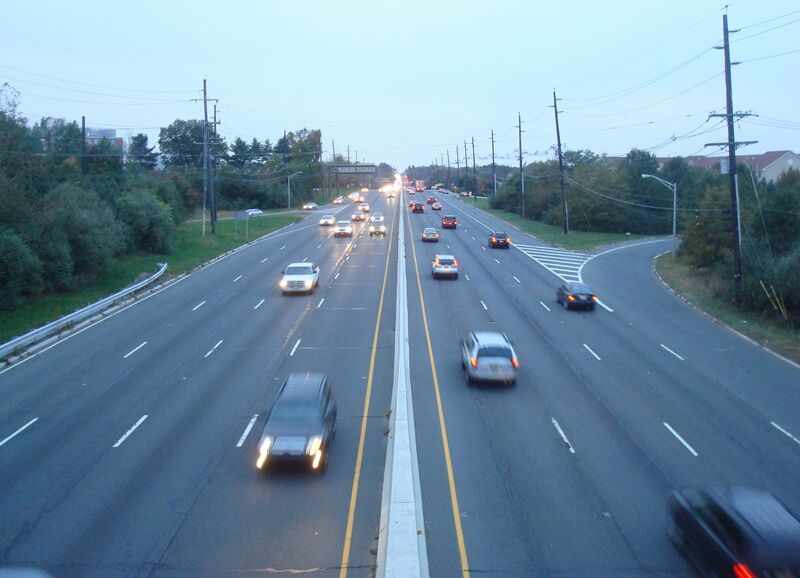 In the coming months, the municipalities of West Windsor, NJ and Princeton, NJ will announce a new plan to expand Route 1 in association with NJDOT. While it’s easy to understand why they want to do this, expanding Route 1 continues a futile effort to relieve traffic congestion by making space for more cars. New Jersey and Princeton in particular ought to show more creativity in finding real solutions for regional transportation. Route 1 by Princeton is a monster that we keep feeding. Local towns such as West Windsor and Lawrence have zoned their retail on the highway, a tactic which aims to keep cars off local roads, but which instead increases traffic by making retail entirely car-dependent. Princeton is culpable in this too. Not only did we outsource our hospital to Route 1, we refuse to add much-needed housing in town, leading developers to add denser housing directly on Route 1 instead. The new malls and housing drives huge amounts of traffic on Route 1, because they are almost inaccessible by any transport mode other than cars. From the perspective of NJDOT, this defeats the purpose of the road. Route 1 is supposed to be an inter-state highway. It was not really intended to be used for Central Jersey commuters to pick up some groceries on their way home from work. When NJDOT closed jughandle entry points to Princeton in 2012, outrage ensued. Local elected officials demanded (and successfully won) an end to the scheme, as neighbors complained about dangerous U-turns carried out by drivers determined to beat the new traffic layout. Yet NJDOT considered the plan to be ‘partially successful’. Why? Because it improved north-south traffic movement. Local people might say ‘who cares about inter-state drivers, what about us?’ But we can’t expect State-level authorities to be infinitely patient with this attitude. Lobbying from Princeton-area residents successfully blocked a previous plan for inter-regional transport- the Somerset Freeway, which would have relieved traffic on Route 1 by channeling cars along a new highway to the north of Princeton. In the likely event that local mayors describe a new plan to expand Route 1 as ‘a successful example of regional cooperation’, you’ll have to pardon us for rolling our eyes. Expanding Route 1 is a Band-aid solution that will enable local municipalities to keep on zoning in an unsustainable way. A road expansion would likely be very popular, because thanks to the economic madness of transfer payments to fund transport infrastructure, the enormous cost of the road ‘improvement’ would be hidden from local taxpayers. And it would temporarily improve traffic flow, until new cars fill up the new roadway (by which time the current mayors will be retired). Expanding Route 1 has never improved traffic flow. We keep expanding it, and traffic keeps getting worse. The definition of madness: doing the same thing over and over, but expecting a different outcome. Aside from being a horrible road to drive on, a near-impossible road to walk or bike on, and a totally degraded place, Route 1 has also now become ‘too big to fail’. Any accident or minor weather event can be expected to lead to horrible traffic snarls, just like this ‘traffic nightmare‘, or this recent accident, which caused >1 hour delays. Just like our overgrown banks, which threatened to destroy the economy when they encountered difficulties, Route 1 has become so essential to local commerce that we will take extraordinary measures to keep traffic moving on it. It’s about time we took responsibility for regional transportation, instead of searching for quick fixes. The solution is not to keep making Route 1 bigger. Real regional cooperation will require us to resurrect plans for Route 1 Bus Rapid Transit, and to grow our downtown areas instead of the Route 1 ‘edge city’. (Both of these policies were recommended by local transportation experts in the Route 1 Growth Strategy.) We need to reduce our dependence on Route 1. By maximizing housing and retail in our towns, a greater proportion of trips can be accomplished in future by walking and cycling, instead of by car. Zoning walkable retail and housing will invariably be opposed by neighborhood residents, who see it as adding to local traffic. But by reducing the average length of trips and taking cars off Route 1, we would make our local area more resilient, promote local businesses, and reduce overall vehicle-miles-traveled. What do you think? How can towns in the Greater Princeton area relieve traffic congestion on Route 1? Do you see advantage in expanding Route 1? Do you think it’s a good use of $40 million? Should we reconsider the Somerset Freeway plan? Or is the solution to increase non-car transportation modes? Have your say using the comments box below! This entry was posted in Alternative Transportation, Local, Princeton, Smart Growth, Sustainability, Traffic, Transit, Zoning and tagged New Jersey, Princeton, Roads and Highways, U.S. Route 1. Bookmark the permalink. 2 Responses to US Route 1 In Princeton: Too Big To Fail. Not exactly the answer to all route 1 problems, but one thing that annoys me: when I go down to the shops on rt1 I usually combine visits to a number of different shops. The problem is that in some cases it is impossible to get from one mall to another without using rt1 itself. If there was an inter-mall road system running parallel to rt 1 then I’d definitely use cut down on using rt1 for short hops between malls. Taking a 20,000 foot view I’d much rather skip rt1 altogether, but it seems that’s where businesses want to set up – just look at Chipotle. Agree with wow, we need a light rail people mover connecting the malls – also, just take the right lane of Rt 1 for the BRT, set up the stations where the shoulder is now.